Cape Town – Build systems and relationships of mutual accountability for effective water management between the spheres of government – this is one of the key lessons to be learnt from the near-crippling Cape Town drought. The African Centre for Cities has released a new paper unpacking the drought and the lessons learnt by Associate Professor Gina Ziervogel, before National Water Week next week. Ziervogel works in the Department of Environmental and Geographical Science at UCT. The research, commissioned by the Cities Support Programme, within the National Treasury, aimed to ensure that lessons learnt from Cape Town’s experience would serve to inform other municipalities when adapting to drought and water insecurity. Data was collected through 21 interviews with senior officials and experts who were intimately involved in the drought response, and distilled into 12 lessons across four areas of action that could help municipalities adapt to drought, namely: strengthening governance; improving data, knowledge and communication; taking a systemic approach; and building adaptive capacity. Ziervogel’s research revealed the complexity of urban governance and how something that might initially seem like an environmental concern so clearly impacts on all aspects of city life, including economic opportunities, politics and social dynamics. Therefore, different actors needed to be involved in responding to a city-wide event, both within the city, between the different spheres of government and with citizens. Local government in Cape Town and most other cities did not have the adaptive capacity to respond flexibly and comprehensively enough to these complex problems, Ziervogel found. “New ways of working are needed that build capacity to deal with these problems. Central to this is the ability to strengthen collaboration across actors and draw on robust data and expertise to inform decisions. Climate change adaptation cannot be the responsibility of one actor alone,” Ziervogel said. Cape Town avoided “Day Zero” due to the remarkable collective achievement of halving water consumption. This could only have been achieved through both changing citizens’ and businesses’ water-use behaviour along with the numerous water- demand-management measures that were implemented by the City, she found. 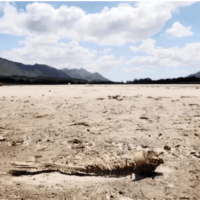 While the paper uses the Cape Town drought as a case study, it also speaks to the wider issues of how a city responded to a widespread climate shock. “In the context of South Africa, with high levels of inequality and informality, basic needs need to be urgently addressed. “Yet if these responses do not consider climate change, they are likely to be undermined. “For example, if low-income housing developments are built on a flood plain and do not considering ventilation and how hot it might get, residents will be negatively impacted. Many of these residents are likely not to have the insurance to deal with flood impacts and will battle to pay the price of health costs. “The drought in Cape Town was a good example of how a city responded to a widespread climate impact, that had different impacts on high- and low-income households,” Ziervogel said. This article was first published on 14 March 2019, on www.iol.co.za. Gina Ziervogel is an Associate Professor in the Department of Environmental and Geographical Science at the University of Cape Town.